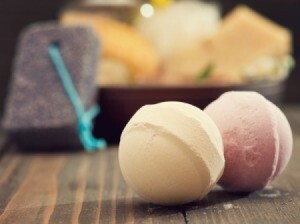 Bath bombs are a fun craft to make for yourself or as a gift. This is a guide about making bath bombs at home. Bath bombs can be tricky little things to make, or more particularly, to get right! Here are a few common problems, issues, and tips if you're having problems attempting these creations. Remember that bath bombs are basically baking soda, citric acid, and some sort of moisturizing oil. Scents and colors can be added as needed. 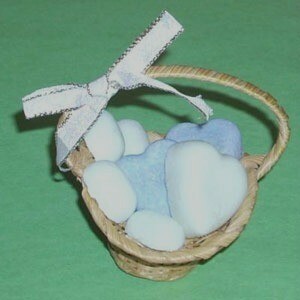 Pretty shapes can be used, as shown by my heart and bean bath bomb mini-gift basket picture. The exact recipe for the perfect bath bombs doesn't exist, since it all depends of what exact ingredients are being used, as well as the general humidity level of where you live! Getting a bath bomb right means finding that perfect balance between dry and wet enough to form and hold. If you get the bomb too dry, it will crumble and fall apart, no matter how long you let it dry. If you get the bomb too oily, it will become a goop and never dry out, unless you bake it hard in the oven. If the bomb is too wet with anything containing water, it will fizz, growing like a monster out of its mold. The best advice is to just try some of the many bath bomb recipes out there, and adjust the ones you like the most for great results. Remember that bath bombs can also contain cornstarch, oatmeal, scents, moisturizers, colors, dried flowers/herbs, and other fun extras. If you're bath bombs are fizzing out of their mold, it means they're too wet. The food coloring or fragrance you used may have been water based, causing the citric acid to fizz out. If the problem is minor, you can wait a few minutes for everything to fizz, then mix bomb batter again, and press into molds. If the problem is major, you may need to mix in more baking soda, or ditch the batch all together. Citric acid is often used for canning, or in pharmacies. Some people claim to find it at stores like Wal-Mart, but it is pretty rare. What most people find are fruit preserving powders that contain citric acid. Most pharmacies only have citric acid tablets, which are expensive and too compressed. Look for loose citric acid at stores with canning supplies, emergency survival supplies, pharmaceutical supplies, health food groceries, or bath making supplies. The finer ground the citric acid, the better it will work. To get the best bath salts you need to know the exact recipe that works. After that, it has a lot to do with the steps. Always mix the dry ingredients, like baking soda and citric acid, together completely before adding anything moist. Try to mix the moist ingredients together before adding them to the dry stuff. This means mixing the oil, coloring, and fragrance together in a little bowl. They will not blend, but rather break into tiny dots. This helps spread the water levels, making sure no one "pocket" of water hits the citric acid, causing undue fizzing. When you mix wet and dry ingredients, make sure to mix very, very, very well. You want everything nice and even, without any oil pools or dry clumps. When you press the batter into a mold, make sure to press it in evenly and firmly. This will make the bombs strong and solid, where just lightly pressing it in can leave bubbles of air. I am a first time bath bomb maker and I was not able to put the mix in the molds as soon as I finished mixing the ingredients and it hardened. I was wondering if there was a way to salvage it and still be able to make bath bombs or do I need to throw it away and start over? There are two schools of thought..one says reform them using water soluble paper... which seems expensive and unnecessary when least expensive and easiest trick is to crush them up, put them in a pretty jar, and use them with a spoon or scoop for your bath. Once you get the right mix, if you have any other mold fails, you can add the jarred version to your repertoire! They make cute gifts!! Have fun with the process!!! This same thing has happened to me. I just spritz the ingredients with water or witch hazel. I was then able to form my bath bombs. It works for me everytime.